The Airfryer is one of 2016's hottest gifts, but is it right for your kitchen? The ultimate gift for healthy home cooks? Walk into any Crate & Barrel, Sur La Table, or Williams-Sonoma this season and you're bound to encounter an Airfryer—usually as part of a special display. It's such a hot gift this year that Oprah even included one in her Favorite Things 2016 list. That's because these countertop cookers promise the taste and texture of deep-fried food, but with just a fraction of the oil, a fraction of the time, and a fraction of the kitchen skill. That's a bold claim. But we're in the business of testing bold claims. Reviewed.com has examined thousands of large and small appliances in our state-of-the-art test lab in Cambridge, MA. But when Philips—the company that lays claim to the "original" Airfryer—offered to send us its latest model, we took it home for testing in the real world. Despite the name, there's no frying going on inside your Airfryer. To fry means to cook in fat, and that's not what this machine does. 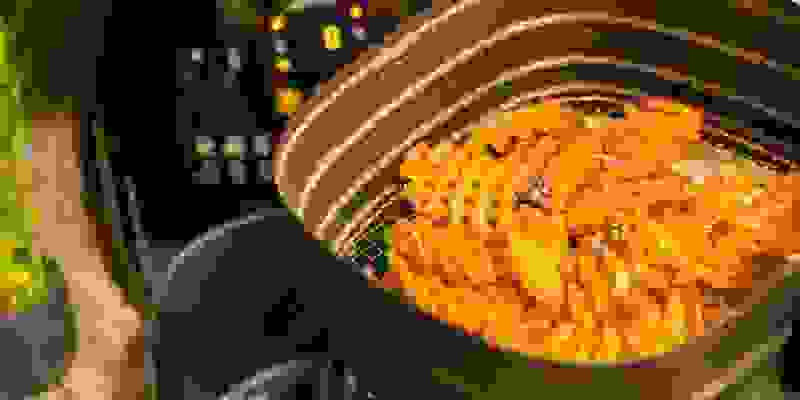 An Airfryer is a self-contained, countertop convection oven (so an oven with a fan inside), but with a vertical orientation: The fan blows down from the top of the device through an electric heating element. Air flow starts at the top, heats up, then rushes onto and around your food through a mesh cooking basket, and finally down to a shaped drip tray that recirculates the air back to the top. Your food is suspended in the middle of all this airflow. That mesh basket, by the way, kinda-sorta looks like a deep fry basket and it's probably where they got the name. But there's no oil reservoir or anything like that. 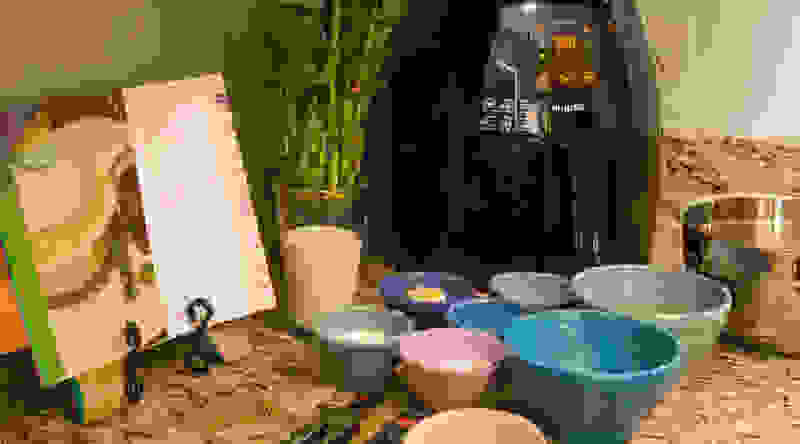 In fact, despite Philips' claims that you can "fry, grill, bake or roast using a tablespoon or less of oil," some recipes actually call for no oil, or two tablespoons, or more. It depends. For our first real-world test of the Airfryer, I made turkey sliders using a recipe developed by Gordon Ramsay for Philips. According to a company spokesperson, it's the recipe that Airfryer customers report the most success with. Now I'm no Gordon Ramsay, but I can follow instructions well enough. In other words, I'm right in the middle of the Airfryer's target demographic of amateurs with an interest in home cooking. If I ran into trouble, we expect others might as well. Stovetop sliders on the left, Airfryer sliders on the right. The airfried patties have a thinner sear but it surrounds the meat completely. On the right we see the airfried sliders and, we've got to admit, there's a pretty legit sear on them! The patties have risen too much, so I'd probably indent the centers next time, but it's a surprisingly browned and delicious-looking burger. Internally, the meat had a spongey consistency (it's baked, remember), and this very first use of the Airfryer imparted a slightly off flavor, like Crock-Pots sometimes do. But for hands-off cooking the taste wasn't bad at all, and it freed me up for the Sriracha mayonnaise, pickled jalapeños, and toasted buns. On the left are the sliders from the stove. I found them juicier, but not by much. The sear, while thicker, only covers the surfaces in contact with the pan. But this time there's no off taste from the Airfryer, and the patties have better consistency and mouthfeel and have also retained their shape. Still, stovetop cooking was far more effort for sliders that tasted only a bit better than their airfried counterparts. This round goes to the Airfryer. Now that we've got burgers, we need fries. It's a rule. For Part One of our French Fry Showdown, I hand-cut quarter-inch fries from russet potatoes, cooked half of them in the Airfryer according to the included recipe, and gave the other half an honest-to-goodness deep fry in hot peanut oil. You already know how the deep fried ones came out. Crispy on the outside, fluffy on the inside, golden brown, and delicious. Could the Airfryer compare? Nope. The airfried fries were dry, hard, and barely edible. Note the color difference pictured above. The absence of oil from the airfried fries means less golden browning on the outside, less of the all-important Maillard reaction that gives browned food its flavor, and a less-appetizing appearance. Some of the fries on the right are nearly golden brown but, as you'll now see, these have come at the cost of moisture. The deep fried fries are on the left in both of these shots, showing how much of the fluffy interiors have been lost. Bisecting each fry makes it obvious how much internal moisture has been lost during airfrying. The deep-fried fries still have plenty of starchy, moist potato inside, but the airfried fries are shriveled and nearly hollow with moisture loss. I also gave the fries an informal "smoosh test," subjecting each set to equal pressure. The crispy exteriors of the deep-fried fries gave way to moist potato, while the airfried fries simply flattened or shattered. That's a terrible result for the Airfryer, and this was one of the first recipes in the book! Let's try this again. For Part Two of the French Fry Showdown we grabbed some store-bought frozen fries. Who doesn't love a bag of waffle-cuts? Half of them went in the oven at 425°F, the other half... actually, it's complicated. My frozen fries lacked convection instructions, but there are three ways convert from conventional: lower the temperature, lower the time, or do a bit of both. Since this Airfryer maxes out at 390°F anyway, I kept the timing and lowered the temperature by 30%. Nothing like a bit of math to whet your appetite. Conventional oven fries on the left in both shots. The color looks correct in both, but the smoosh test reveals all! The color comparison is much closer this time. There are a couple burnt ones on the Airfryer side, but both sets have golden crusts and, unlike the last trial, both are fries I'd like to eat. Unfortunately, the smoosh test reveals moisture loss once again, making my conventional oven the winner on taste. One plus for the Airfryer: Thanks to a four-minute preheat, it was much quicker. Fried chicken is the most popular search term that accompanies "Airfryer." I went with breast tenders because they dry out more easily, and I felt it would make a more valuable test. But let's briefly set aside taste and talk about convenience, because one thing you notice when you're deep frying at home is how much of a pain it really is. You've got hot, dangerous, scary oil that changes temperature slowly, bubbles over almost instantly, and requires your constant attention. Then you've got to filter your oil and then you've got to store it somewhere, or throw it out, which is wasteful. Deep fried on the left, airfried on the right. A batter is preferred for deep frying, but I used the same breadcrumb coating for consistency's sake. 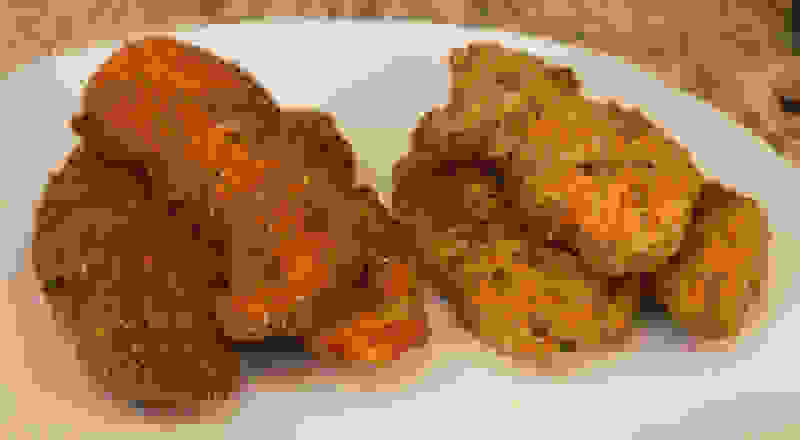 Obviously the deep fried tenders have better color. So of course my deep-fried chicken tenders were crispier, more succulent, and the breading was attached more thoroughly. But man what a pain they were. If you're going the Airfryer route, just bread 'em and throw 'em in the preheated machine. Minutes later you've got good fried chicken, hot and ready. 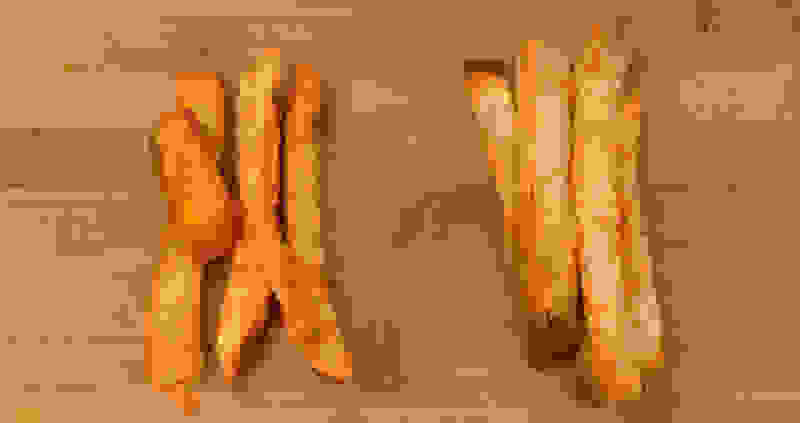 Deep fried on the left, airfried on the right. Note the Airfryer chicken's breading is starting to slough off. It will separate more easily when I sit down to eat. Like the French fry test, I did a second round here as well, this time with frozen chicken nuggets. And just like the hand-breaded tenders, this time the difference was all about convenience. Conventional oven on the left, Airfryer on the right. You can see the nugget on the right is a little more dense, while the baked nugget on the left has more gaps where moisture and flavor live. While my conventional oven put a little more color on the frozen nuggets, and they came out a touch juicier, the flavor difference was minimal. The difference here was timing. From a cold oven to a hot snack, your Total Tenders Time is about 24 minutes in a conventional oven. On the other hand, our frozen nuggets did offer convection instructions on the box and, using these, our Total Tenders Time was just 10 minutes. This right here is the best reason to own an Airfryer. Oh yeah! On the last page of the Philips Avance XL recipe book—almost like they don't want you to see it—is vanilla soufflé. 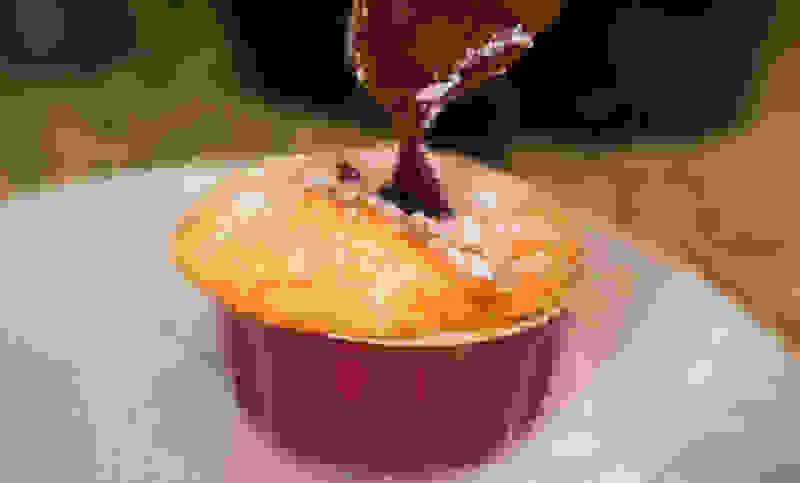 It's a dish that's beaten better chefs than I, but if an Airfryer could simplify the legendary soufflé, that'd be worth the price right there. Chocolate: my favorite topping for vanilla things. My soufflé did rise, so we're off to a decent start. Flavor and texture were also right on target, with a browned top and gooey interior. Yet this isn't the Airfryer showpiece I was hoping it would be. First, with proper baking and a buttered, sugar-dusted ramekin, a good soufflé will rise evenly with a flat top. Mine wasn't quite that pretty, but let's give the Airfryer a pass since my own technique could've been the culprit. Um... I was told this would be simple? There's no convection magic at work here, and the presence of an Airfryer didn't save any time or labor. In fact the recipe basically calls for a complete soufflé base... but you put it in the Airfryer instead. It was delicious, but the results were no better than a conventional oven. Philips' signature "starfish" drip tray, designed to improve airflow inside the device, is mercifully non-stick and easy to clean. Don't worry about the Teflon, by the way: the Airfryer can't get hot enough to degrade it, and your food doesn't even touch this surface. Ironically, food particles wouldn't cook onto a real fry basket as badly. Sadly the food basket is prone to small, stuck-on food particles accumulating in the mesh. That—plus a few sharp corners—will make hand washing with a sponge rather annoying. Your best bet is the dishwasher, but you'll need plenty of room. There are a couple reasons why I won't buy an Airfryer. First, my kitchen's too tiny. We did test Philips' extra large version, but most Airfryers will need about a square foot of counter space, plus a "runway" in front where the drip tray and cooking basket drawer can slide out. It's also heavy and probably too large to even stow away in a cabinet. No, an Airfryer's got to live on your countertop permanently, and it claims way too much real estate for a single-purpose appliance. Single-purposeness, by the way, is deal-breaker number two. An Airfryer is at its best when you need packaged frozen foods finished now. If that resonates with you or someone on your gift list, then this machine really will halve the time between them and hot fries or tenders versus a conventional oven. Me? I'll wait the full 25 minutes in exchange for one less gadget cluttering up the house. The Airfryer's at its best competing against a conventional oven. Neither is an Airfryer a good option for serious home cooks chasing the best flavor. In all cases conventional cooking, either on a stovetop or in an oven, offered better flavor and texture. We also question the "healthier cooking" claims. Sure deep-frying will always result in more calories than airfrying the same food, but that's true of conventional baking too. Plus, wouldn't you rather have a handful of great fries than a whole basket of dry ones? So no Airfryer for me but, if you'd like to buy one anyway, maybe for a college student or a "culinarily challenged" spouse, or even for low-key movie night snacks, you can do so right here.